The serenity of a fresh snowfall is accented with beautiful cardinals as the focus of this gorgeous collection. The geometric, almost quilt-like coordinate is a striking compliment. 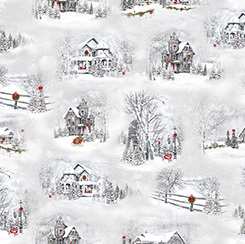 Enjoy the nostalgic feeling of returning home for the holidays from © Nancy Fullenwider.